This year IWC Schaffhausen announced a number of special Portugieser watches as part of its 150th birthday Jubilee collection : the Portugieser Constant-Force Tourbillon Edition ‘150 Years’, Portugieser Perpetual Calendar Tourbillon Edition ‘150 Years’, Portugieser Perpetual Calendar Edition “150 Years”a Portugieser Chronograph, and the subject of today’s post, a very handsome anniversary edition of the Portugieser Hand-Wound for the vintage-inclined. The IWC Portugieser Hand-Wound Eight Days ‘150 Years’ comes in two limited edition variants, of which we got to see one. The Ref. IW510212 that is featured in this post has a stainless steel case and comes in a limited edition of 1,000 pieces, and the Ref. IWC510211 is in an 18 carat red gold case, with a limitation number of 250 pieces. The cases are 43.20mm in diametre, and 12.20mm thick. Both models feature the same white lacquered dials and blued feuille hands, regardless of the metal, along with black printed indices and numerals. With a small hacking seconds as well, it’s pure classic vintage dress watch look, and a very attractive piece ‘in the metal’. Some will prefer smaller sizing for a dress watch, but this is IWC, so by their contemporary watch size standards, this is on the lower end of things size-wise. Inside is the manual-wind Calibre 59215 (base Calibre IWC 59210) which beats at 28,800VPH and has eight days of power reserve (for which the indicator is visible through the open case back), with a special Jubilee collection medallion in 18 carat gold. 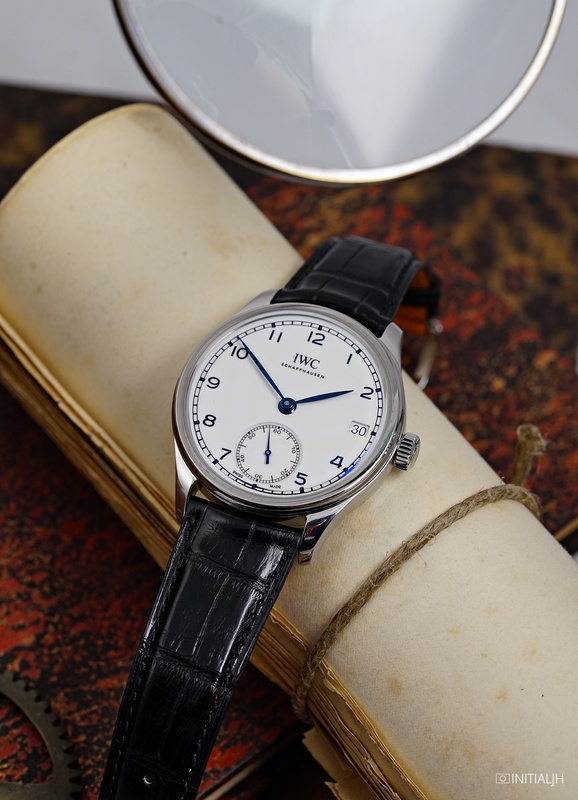 Other IWC models that have used the same movement have been the Portugieser Hand-Wound Eight Days (2014), Portugieser Hand-Wound Eight Days 75th Anniversary (2015), Portugieser Hand-Wound Eight Days BFI London Film Festival 2015, and the Big Pilot Heritage 48 (2016). Both models come on black alligator Santoni straps and have an RRP of 9,950 EUR.